It may seemdownright bizarre, but a new model of Venus' super-hot atmosphere suggests its greenhousegases may actually be cooling the planet's interior. These gasesinitially cause Venus' temperature to rise, but at a certain threshold, they cantrigger dynamic processes ? which researchers call "mobilization" ?in the planet's crust that cool the mantle and overall surface temperature,researchers found. "Forsome decades we've known that the large amount of greenhouse gases in theatmosphere of Venus cause the extreme heat we observe presently," saidstudy leader Lena Noack of the German Aerospace Center in Berlin.? Carbondioxide and other greenhouses gases that led to Venus' hellish temperature werebelched into theplanet's atmosphere over time through eruptingvolcanoes. Noack andher colleagues examined the interaction of carbon dioxide and other greenhousegases in Venus' atmosphere and conclude that the planet may have been evenhotter than it is today, Noack said. "But ata certain point this process turned on its head ? the high temperatures causeda partial mobilization of the Venusian crust, leading to an efficient coolingof the mantle, and the volcanism strongly decreased," Noack said. "This resulted in lower surface temperatures, rather comparable to today'stemperature on Venus, and the mobilization of the surface stopped." Noack andco-author Doris Breuer built a one-of-a-kind Venus computer model in which theplanet's hot atmosphere was paired with a 3-D model of the interior. Unlike onEarth, Venus? high temperatures have a much bigger effect on the rocky surface,which ultimately loses its insulating qualities, the researchers said. "It's alittle bit like lifting the lid on the mantle: The interior of Venus suddenlycools very efficiently and the rate of volcanism ceases," Noack said. "Ourmodel shows that after that 'hot' era of volcanism, the slow-down of volcanismleads to a strong decrease of the temperatures in the atmosphere." Their modelsalso suggested differences in the time and place in which the volcanoesresurfaced Venus over time. So even as Venus'atmosphere cooled, there would remain a few active volcanoes which resurfacesome spots with lava flows, researchers said. 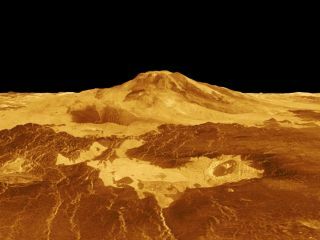 In fact, some of these volcanoesmight be active even today, according to recent results from the European SpaceAgency's Venus Express mission. VenusExpress launched in 2005 and arrived at the cloud-covered planet a year later. The spacecraft recentlydetected 'hot spots' on Venus, or areas of unusually high surface temperatures,at volcanoes that were previously thought to be extinct.